We Slovenes are the only Alpine nation to associate our national identity with the mountains. In the mountains we have defied invading nations, expressed our patriotism, and defended the Slovene identity while the mountain summits flew Slovene flags. On the summit of Triglav, the highest of the Slovene mountains, Jakob Aljaž erected his famous tower, a symbolic image also adopted by the Slovene Alpine Museum. The Slovenes have managed to maintain a continuous link between the once barefoot shepherds and today’s top world-class alpinists. The mountain world is also an invaluable source of fresh water, clean air and unspoilt nature. Mountaineering museums throughout the Alpine countries are important institutions for deepening this historical memory, awareness and national identity. 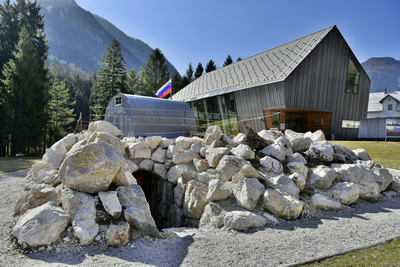 The Slovenian Alpine Museum preserves the mountaineering tradition of the Slovene nation by displaying the historical activities of the Slovenes in the local and foreign mountains, and by showing the beauty and worth of the mountain world. It educates the young in the spirit of mountaineering and respect for nature. Here the past and the future go hand in hand. A rich collection of items with diverse historical stories, and rich photographic and archive material give the visitor the chance to grasp the popularity and importance of mountaineering in Slovenian territory. The permanent exhibition is based on the concept of a museum story, which we experience through our own climb up the mountain. Rich audio-visual and photographic material and interactive content are presented in 11 theme groups. In this way we get to know the history, the mountain routes, and the reasons, the dangers and the joys of mountaineering. And as we reach the destination we are, as every mountain climber, rewarded with a spectacular view. The exhibition or your museum mountain climb is a personal, hands-on experience of the Slovene mountains and their history, designed to be experienced just like a real mountain climb. Our permanent exhibition is based on the idea that the way is the story – the story is the way. We walk through the collection of 11 chapters, and the way is marked from the bottom to the top of the mountain. The museum narrates the story of Slovene mountaineering, strongly associated with patriotism. It follows the development of Slovene organised mountaineering and first climbing aspirations, all the way to the modern-day world famous climbing achievements of Slovene climbers at home and abroad. You will be acquainted with the first mountain guides, porters, and hard-working peasants laying out the first mountain trails, and mountain rescuers, as well as our best modern day alpinists. The collected objects, documents, photographs, events, incidents and stories have been joined together in the story about the development of mountaineering in Slovenia. Modern audio-visual aids and entertaining inserts in individual content groups connect the historical story with the present day. The introductory movie The Lights of the Mountains shows the beauty of the Slovenian landscape, with special emphasis on the mountainous part of our country and its geographic and flora and fauna diversity. The movie is at the same time an invitation to the Museum and Slovenian mountain world. The exhibition is partly adapted for the blind and visually impaired, and is accompanied by temporary exhibitions which complement the contents of the existing exhibition and make it even more interesting. We give you a unique opportunity to take a virtual tour of Triglav’s summit and 30 other mountain tops around Slovenia. The permanent exhibition will take you on a tour – a mountain climb – through the history of mountaineering in Slovenia. The path leads through eleven thematic sections and milestones of Slovene mountaineering, alpine climbing, and the mountain rescue service, illuminating the various motives which have inspired people to enter the mountain world since prehistoric times. The trail around the exhibition is waymarked by the distinct Slovene trail blaze, named after its designer, Alojz Knafelc. It indicates the interactive sections where visitors can test their knowledge and collect stamps for each correct answer. Those who manage to collect all five are in for a treat. The Slovene Alpine Museum is quite an adventure for all generations. Our museum programmes and events encourage socialising and foster the development of mountaineering culture, as well as providing education. But most of all we want each and every visitor to have a good time. For the younger generations the museum is an endless source of knowledge, which is why we pay special attention to our youngest, most vulnerable visitors. Our carefully thought-out educational programmes and interactive content are designed to encourage learning and creativity in a fun way. But of course we did not forget about our adult visitors. Our varied temporary exhibitions, lectures, projections, and workshops offer something for every taste. In 2016 we enhanced the range we offer with a game: Escape to the Bivouac. The legendary Bivouac II was built in the Vrata Valley by members of the Skala Tourist Club from the nearby mountain town of Jesenice, Slovenia in 1936. At the end of 2015, they moved the Bivouac to the valley where it enjoys a well-deserved retirement placed on a rocky platform in the meadow in front of our museum. Since it was not possible to change the exhibit component itself, with the cooperation and support of the local community they installed a hidden space in which the adventure path is located. But this is not a classic “escape room”. 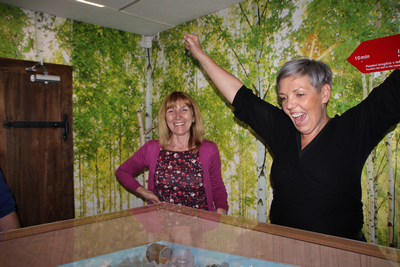 It’s an innovative way of exploring the museum through (game)play that we have developed specifically for the project. We were rewarded with an Honourable Valvasor mention, presented by the Slovene Museum Society for the Escape to the Bivouac project. In 2016 The King Albert I Memorial Foundation awarded our museum the Albert Mountain Award; freedom, ethical and responsible conduct and respect for the alpine environment are the criteria that determine the granting of this Award. In 2017 we enriched our collection with a new museum acquisition: the Burduš, the first Slovene mountain rescue helicopter. The Forum of Slavic Cultures proclaimed the Slovenian Alpine Museum the best Slavic Museum 2017. To ensure you tread the mountain trail safely, not only inside the museum but outdoors as well, besides information on the current exhibitions, events and museum programmes, we offer mountaineering and hiking information, the up-to date weather conditions in the mountains, the availability of mountain huts and shelters, mountain guides, walking routes and trails, safety precautions, and responsible mountain hiking, as well as information on the points of interest in the surrounding area in our Tourist Information Centre. We are also the first Slovenian and easternmost info point of the Alpine Convention. People with disabilities – to gain experiences which they have been deprived of.